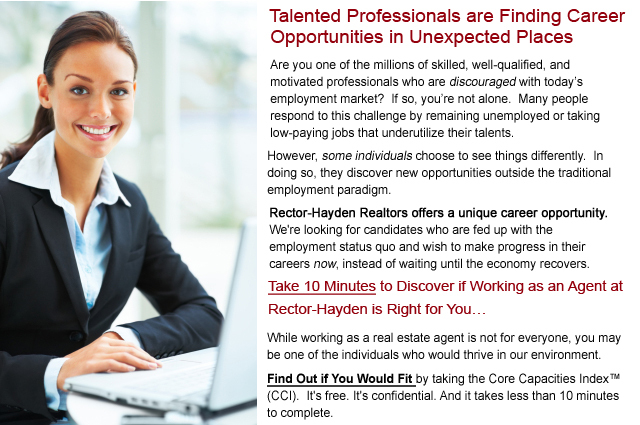 Find the Right Job What Are Core Capacities Missed Opportunities No Real Estate Experience? Why is Finding a Job You Love So Hard? Have you ever noticed that some people love their jobs? They gain traction quickly, naturally connect with their work, and quickly become the best performers in an organization. Unfortunately, this accounts for only 15% of the employees in a typical organization. Are you among the 15% of individuals in your company who are flourishing, or are you among the 85% of people who are having a difficult time finding a job they love? If you’re in the second group, there’s a good chance you’ll remain stuck in jobs that are not satisfying. Do the Math: What Are the Chances of Finding a Job You Love? Unfortunately, the odds are not very good if the process is left to chance alone. Even if you have good competencies and access to high-quality jobs, you could potentially change work environments seven to ten times and still not find a job where you’d naturally flourish. Most people give up after three or four job changes and just resign themselves to a state of languishing in their work life. It doesn’t have to be this way, especially if you’re willing to consider new opportunities. If you’re a smart, diligent, well-trained person who looks around and sees others flourishing while you’re languishing, you’re not only in the wrong job, but you may be in the wrong industry. Why does this happen? Because from an employment perspective, most people define themselves by their education (they’ve received training in a certain area) and experience (they’ve always worked in a certain field or industry). Therefore, it is easy to get stuck doing work that you’ll never find engaging. When you’re stuck, your mind naturally becomes resistant to new ideas. Are You Willing to Consider Something New and Completely Different? What if you could “dip your toe” into a new career field and find out if you’d flourish in this new environment before actually making a change? By taking ten minutes to learn about your core capacities, you will gain insight into your own core strengths. This knowledge is useful when marketing yourself in an interview as someone who is the right fit for a given position. Here’s how it works. Core capacities are a person’s organic talent or natural “wiring.” Each person has a unique “recipe” of core capacities that predicts his or her propensity to perform certain tasks with success and vital engagement. A person’s recipe of core capacities is stable, and does not change much over time. If you happen to be in a job where the tasks you perform on a day-to-day basis align naturally with your unique recipe of core capacities, you’ll experience engagement in that job. If your day-to-day tasks do not align with your unique recipe of capacities, you’ll most likely languish in that job. We’ve spent a large amount of our own time and resources studying the real estate agent position and our own employees for the purpose of quantifying the unique recipe of core capacities a person needs in order to find engagement in our organization. From this study, we’ve developed an understanding of what core capacities tend to make people successful as real estate agents in our company. We would like to give you an opportunity to complete a ten minute evaluation to learn this information as well. The Core Capacities Index™ (CCI) is quick, easy, and confidential. You’ll get to review your results immediately following completion of the assessment. Taking the CCI is one of the quickest things you can do to become more aware of your strengths and values, learn how you perform best, and become more purposeful in your day-to-day tasks. In addition, we'll be able to tell you if your unique recipe of core capacities is closely aligned with the people in our organization who flourish in their day-to-day tasks. People often wonder if having real estate experience is necessary to be successful in our company. The quick answer is no. Unlike most real estate companies, we’ve spent years developing a business process and system that is guaranteed to produce results. Our challenge is to find individuals who have the strengths and capacities that naturally fit with this business process. We’d much rather train to this process than solely depend upon hiring people with real estate experience. The first and most important question we ask: Does an individual have the natural strengths to thrive inside our business process? Take ten minutes to find out if real estate would be a match for you by taking the CCI assessment. To get started, click the continue button above. Privacy Guarantee: As a workplace professional, you must investigate many opportunities to improve your personal performance and career. However, considering a change of career and/or employer is a very personal and confidential matter. The information you provide during this evaluation will not be shared with any third party for any reason. We will not inform your current employer or others in your network that you have contacted our organization for the purpose of learning about your core capacities. We make no exceptions to this privacy guarantee. The CCI is administered via a set of confidential web pages and your personal results will be delivered to your personal email address. Your unique CCI results are yours to keep with no cost or obligation, even if you choose not to engage our company in an employment dialog. The CCI typically takes less than 15 minutes to complete. For your protection, any information you enter will be discarded if the evaluation is not submitted within 60 minutes.